One of the most influential teaching guides ever--updated "Teach Like a Champion 2.0" is a complete update to the international bestseller. This teaching guide is a must-have for new and experienced teachers alike. Over 700,000 teachers around the world already know how the techniques in this book turn educators into classroom champions. With ideas for everything from classroom management to inspiring student engagement, you will be able to perfect your teaching practice right away. 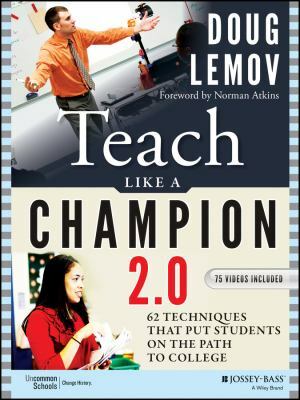 The first edition of "Teach Like a Champion" influenced thousands of educators because author Doug Lemov's teaching strategies are simple and powerful. Now, updated techniques and tools make it even easier to put students on the path to college readiness. Here are just a few of the brand new resources available in the "2.0" edition: Over 70 new video clips of real teachers modeling the techniques in the classroom A selection of never before seen techniques inspired by top teachers around the world Brand new structure emphasizing the most important techniques and step by step teaching guidelines Updated content reflecting the latest best practices from outstanding educators With the sample lesson plans, videos, and teachlikeachampion.com online community, you will be teaching like a champion in no time. The classroom techniques you'll learn in this book can be adapted to suit any context. Find out why "Teach Like a Champion" is a "teaching Bible" for so many educators worldwide. New (801 available) BRAND NEW. Over 1.5 million happy customers. 100% money-back guarantee. Make your purchase count: support Better World Books' worldwide literacy partners.